Vegan Strawberry Cheesecake Bites. I just love this time of year. All my favorite fruits are in season. I made these Vegan and Gluten Free Strawberry Cheesecake Bites the other day and they came out delicious! They are a super cinch to make, but they look fancy. These would be the perfect dessert for any summer party. I love that they are perfectly proportioned. Just the right bite of sweetness. I made mine in muffin cups, but you can also just make one big cheesecake if you prefer. If you also love strawberry desserts, you may also like my Strawberry Creme Truffles or my Strawberry Rhubarb Crisp. 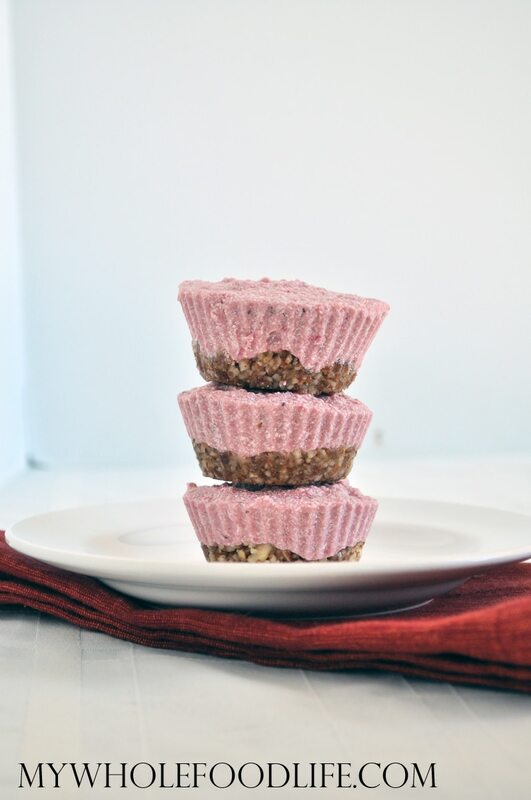 These vegan strawberry cheesecake bites are vegan, gluten free and paleo. They don’t take much time to whip up at all. I also think any berry will work in this. One helpful hint for this recipe: if you buy the cashews in pieces vs whole, they will be much cheaper. 🙂 You could also drizzle a little of my 3 ingredient chocolate over the top of these. If you do that, then these will have to be stored in the freezer. Here is a short video on how to make the chocolate. For more videos, you can subscribe to my You Tube Channel. Looking for more vegan cheesecake recipes? Drain and rinse the cashews. In a food processor , combine the dates and almonds. Slowly, a little at a time, add water until you see the mixture clump together. Once it looks like it's holding together, press a little bit into the bottom of each muffin cup . I used silicone muffin liners for these, but you can also use paper liners. Once all the crust is pressed into the muffin cups, place them in the fridge while you make the cheesecake part. In a food processor , combine all the cheesecake ingredients and blend until smooth. Spoon the cheesecake mixture into each muffin cup. Fill them to the top. Once you are done place them in the fridge to chill. They need a good 6 hours or so to set up pretty well. You can speed up the process by placing them in the freezer for a bit though. These can be stored in the fridge or freezer. Whichever you prefer. They should last a couple weeks in the fridge and up to 6 months in the freezer. Pingback: Museace » » 12 Mouthwatering Summer Treats That WON’T Hurt Your Bikini Belly. Pingback: ViperFUN » » 12 Mouthwatering Summer Treats That WON’T Hurt Your Bikini Belly. Pingback: SpinPing » » 12 Mouthwatering Summer Treats That WON’T Hurt Your Bikini Belly. I just made the Vegan Strawberry Cheesecake Bites and they were amazing! Nobody knew they were raw, vegan and healthy. I have just made 24 of these delicious cheesecakes. Thank you for posting the recipe. I'm just in the early stages of Paleo and this recipe will definitely take care of the need for dessert. They are absolutely delicious. Would I be able to use walnuts instead of cashews for the crust? Would I be able to use walnuts instead of cashews for the filling? What can be used to substitute for the nuts in here? I'm allergic to all nuts. Thanks. I'm not sure of a sub for the nuts in this. If I had to guess, I would say white beans may work? I haven't tried this, though. can i use sunflower oil instead of melted coconut oil? Because the coconut oil solidifies to hold the cheesecake together. Regular oil does not do that. Can you post the calories per serving? Entered into My Fitness Pal and it's 201 calories per bite.